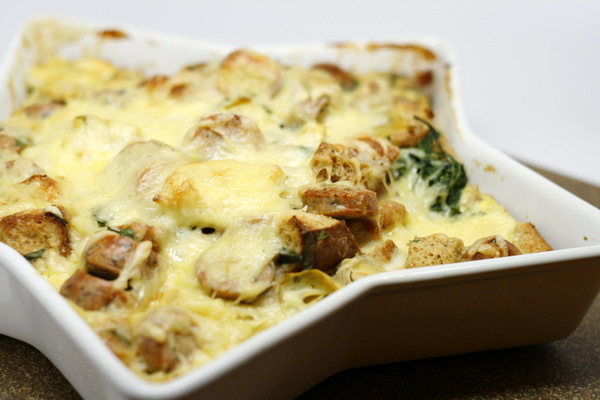 There are so many good things in this casserole – and all the flavors mesh incredibly well. 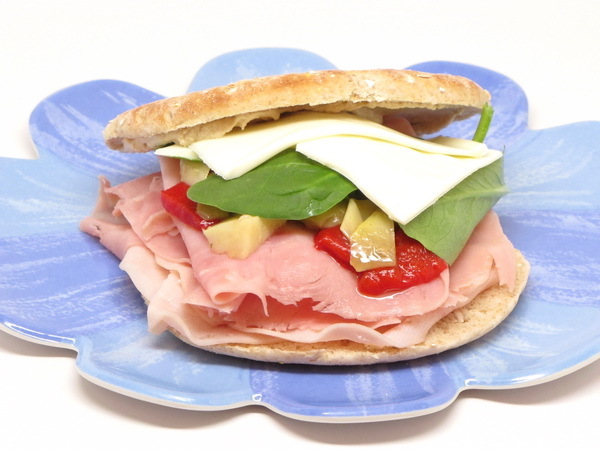 The mellow swiss cheese is the perfect cheese for this recipe. Preheat oven to 375 degrees. Spray a baking dish with Pam. Rinse the arugula and then place in a bowl and cover with plastic wrap. Fold back one edge leaving just a bit of an open slit. Cook 2-3 minutes to wilt the arugula then drain well and squeeze out extra water. Whisk egg whites, Egg Beaters and milk then add Dijon, salt, pepper and basil and stir well. Mix together bread cubes with the arugula, sausage and artichokes. Pour in the egg mix and toss well. Place in baking dish and cover with foil then bake 45 minutes. Sprinkle with cheese and continue baking 20 minutes UNCOVERED. Cool for 15 minutes. This is a perfect meal ! Chicken done so simply turns out the most savory, delicious cutlets. 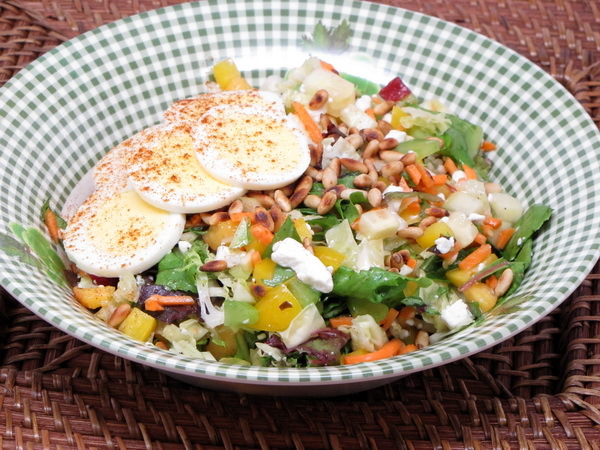 And the lemony salad on the side just bursts with flavor. Simple, simple, simple – but such a great meal ! Mix beans, chickpeas, 3 T lemon juice, 2 T oil, salt and pepper. Spray a skillet with Pam and cook chicken with salt and pepper 3 minutes per side or until done. Mix spinach with 1 T oil and 1 T lemon juice then season with salt and pepper. 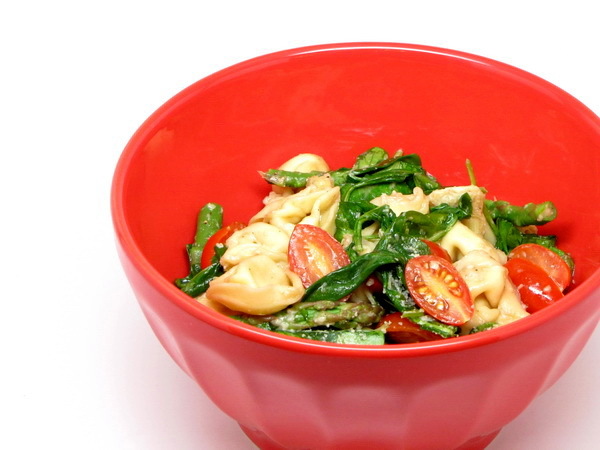 Serve bean salad on top of spinach. Plate chicken and serve. There are a lot of textures and flavors here and that is what makes this such an interesting sandwich. It’s a nice spin on a classic tuna nicoise plate. Drain tuna. 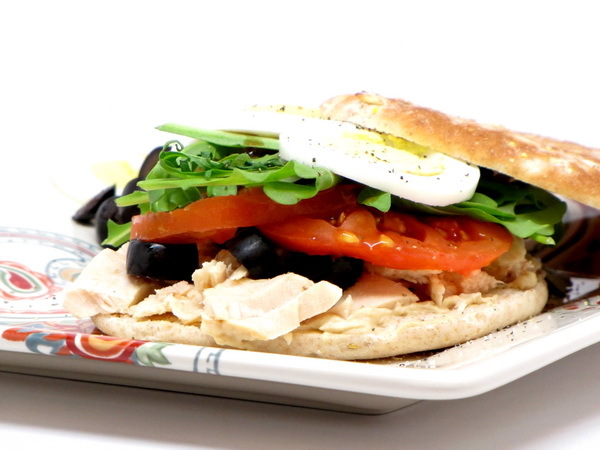 Spread hummus on bottom bun and spread mustard on top bun and build sandwich up in this order – – tuna, olives, tomato, arugula, egg, salt and pepper. The arugula on this sandwich is the perfect pairing to the creamy brie and the sweet apples – it gives it just the right amount of contrast. This is one of my top 10 sandwiches of all times ! 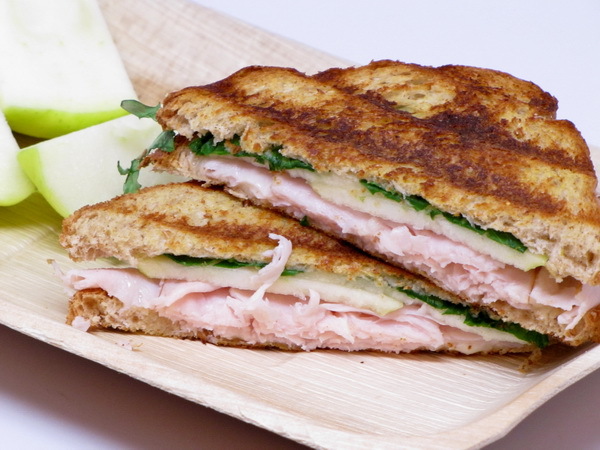 Brie+ turkey+apple+arugula=YUMMY ! Heat brie in microwave 15 seconds or so to soften it and then spread on 2 pieces of bread. 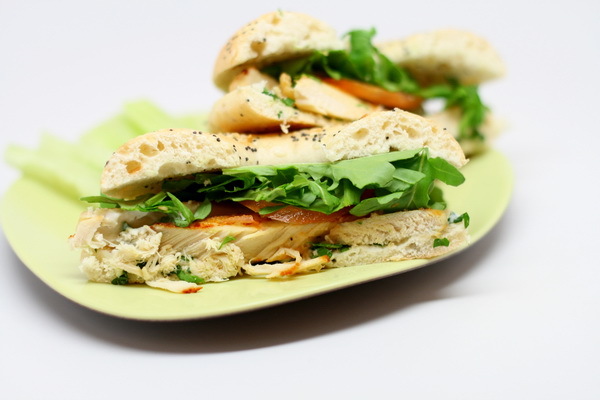 Top with turkey, apples and arugula and finish making the sandwich. Spray a heated pan with Pam. Spray outsides of sandwich with a couple spritzes of butter spray and cook 2-3 minutes per side in a hot skillet or a total of 3-4 minutes in a Panini press. 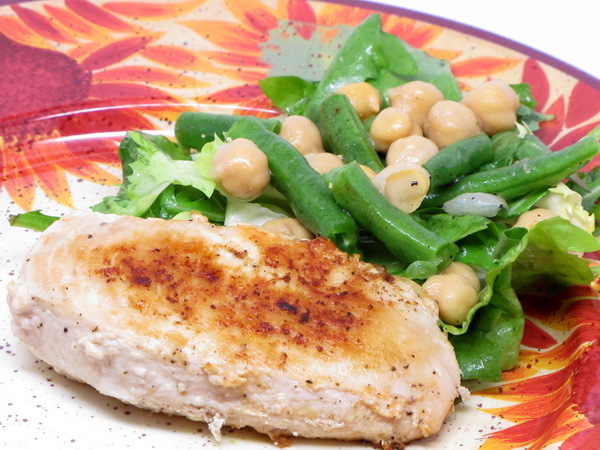 This is a great salad served either cold or at room temperature. 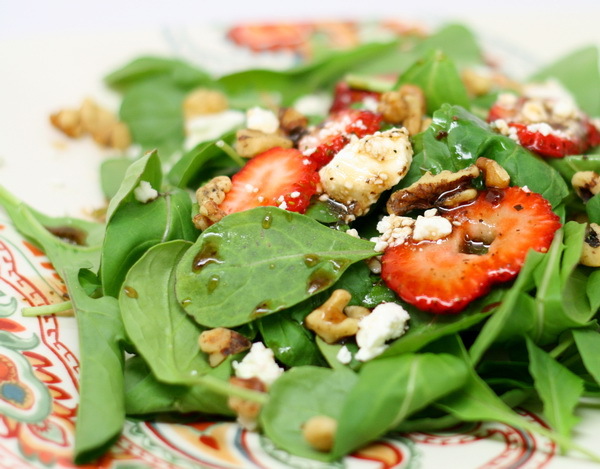 The arugula was a great addition to a classic salad and the buttermilk dressing was light and flavorful. Cook pasta according to package directions adding in the peas during the last 2 minutes of cooking then drain and rinse in cold water to stop the cooking process. 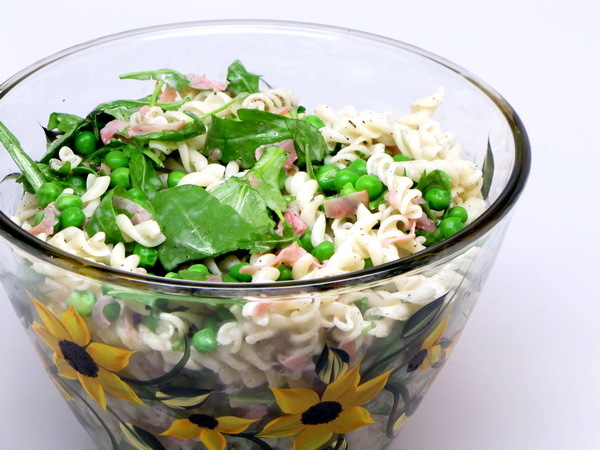 Mix buttermilk, chives, thyme, salt, and pepper and add pasta and arugula and toss well. Heat oil and cook garlic 1 minute then add ham or prosciutto and cook another 2 minutes. Drain and sprinkle on salad.